Time trialling has long been the mainstay of British cycle sport with huge numbers of riders competing every weekend to beat their personal best. It may have been eclipsed by recent successes on the road and track, and no longer be the catalyst for a pro career that it was in the 90’s for riders like Chris Boardman, but it is still a huge part of our sport here in Britain and still something that many British riders, if they make it to the Pro ranks, tend to excel in. However, most British time trial specialists are amateur riders and even the very successful ones still maintain full-time jobs. One of the best, Matt Bottrill works as a postman even though he has done it all in cycling, including having ridden for team GB and for a French elite team on the road. Despite a busy life, with work and children to fit his training and racing around, he is sponsored by Giant UK, giving him access to the very best equipment. Obviously he has the Giant TCR Advanced SL and the Giant Defy Composite endurance road bike at this disposal, but for competition he uses the Giant Trinity Advanced SL. 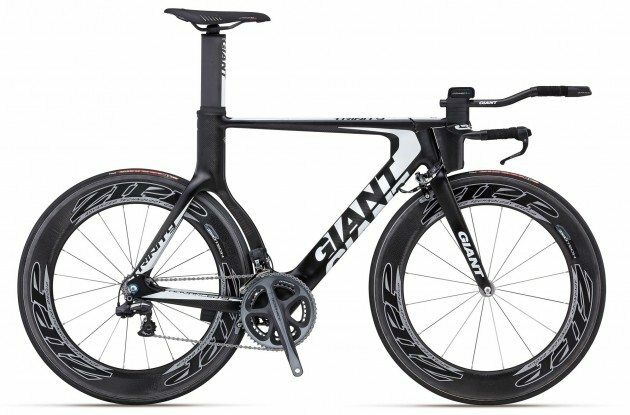 The Giant Trinity Advanced SL time trial bike is a properly ProTour tested time trial bike and famously won the final stage and thereby the overall of the 2009 Giro d’Italia with Rabobank’s Dennis Menchov. It uses the same SL grade composite as Giant’s TCR Advanced SL and the new Giant Propel Advanced SL. SL is Giant’s version of T-800 carbon fibre material and as Giant are one of the few companies to have their own manufacturing facility in Taiwan, we assume they have more control over the exact carbon lay-up and production process than most. The Trinity features Giant’s Speed Control brakeset, with the calipers hidden behind the fork and bottom bracket for added aerodynamics, and the Vector SLR seat post which allows a shift in the seat tube angle from 78.0 to 74.7 degrees so you can find your ideal position over the pedals. Up front the stiff AeroDrive system incorporates the stem, extensions and the headset. So there’s the AeroDrive Base Bar fitted to an AeroDrive stem set with low, middle, and high settings, which in turn is mated to a carbon fork with tapered alloy steerer, via a 1 1/8″-1 1/4″ headset. Its a fast frame with the right rider. 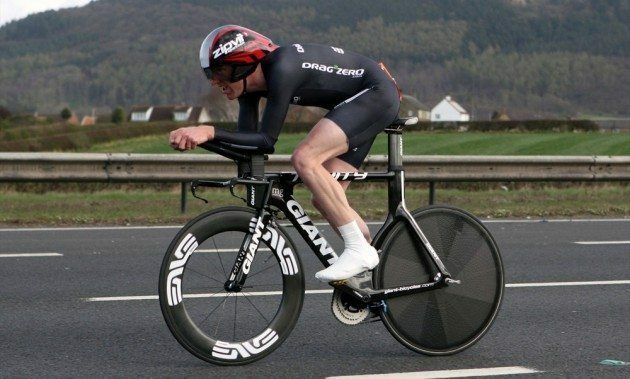 In 2012 Bottrill won the Men’s National 100 Mile Time Trial Championship and managed to medal in all the championship distances of 10, 25 and 50 miles, whilst aboard the Giant Trinity Advanced. For the 2013 season he will have aerodynamics input from a certain Simon Smart, the ex-Formula One aerodynamicist who has had a huge influence on cycling with frames, wheels and now his latest venture, Smart Clothing. Like the Scott Plasma we featured last month, Smart helped develop the Giant Trinity Advanced SL. Bottrill will get to use the new wheels Smart developed in conjunction with Enve and be wearing the new slippery Smart clothing. The Smart Aero Technology suit is fully wind tunnel developed, using a special Smart Aero Technology™ fabric to reduce drag. All of this is helped by the fact that Simon Smart is no stranger to the bike himself with some impressive time trial results of his own. With the Giant Trinity frame, Enve wheels and Simon Smart on his side, we reckon Bottrill must be feeling pretty confident about repeating his 2012 success.